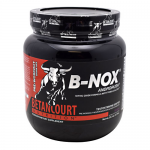 BULLNOX™ is a Pre-Workout Nitric Oxide (NOX) Intensifying drink mix, and one of the only formulas of its kind with a "Super-Set" formula structure whose effects are intended to change with each set that you perform. Like a whirlwind whips the desert sand, delicious BULLNOX™ whips up a NOX-carrying "Androrush" that protects and strengthens your pumps on the battlefield. 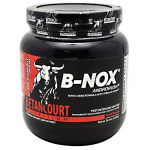 Through the power of BULLNOX™, every muscle is able to swell larger and its strength and power last longer. * Feel the Androrush set by set! 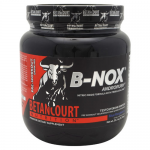 Ingredients in BULLNOX™ were selected on the basis of their potential to support*: * Androgenic stimulation: Support androgen levels as you train* * Unbeatable strength-endurance: Lift more weight for more reps without "gassing"* * Dilation of cardiovascular and muscular tissues: Gain size as you train* * Lasting neuro-emotive energy: The final set feels as incredible as the first* Keep your cellular nitrogen and glycogen levels high and boost your anabolic potential even further! 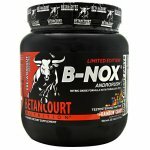 Set by set, BULLNOX™ stays with you! * Set 1 ("Andro Stimulation"): Epimedium leaf extract (standardized to 40% icariins), Lipidium meyenni (Maca) root, Pausinystalia yohimbe (Yohimbe) bark extract (standardized to 8% yohimbine), Tribulus terrestris seed extract (standardized to 40% saponins), Xanthoparmelia scabrosa bark extract 10:1 Purpose: Support androgen levels and muscle anabolism* Set 2 ("Neuro-Emotive Energy"): Anhydrous Caffeine, Citrus aurantium extract (standardized to 6% synephrine alkaloids), Glucuronolactone, Paullinia cupana (Guarana) seed extract (standardized to 50% caffeine), Salix babylonica (White Willow) bark extract (standardized to 15% salicin), Vinpocetine Purpose:Support overall neurological performance, mood, motivation and energy* Set 3 ("Cardiovasomuscular Dilation"): L-Arginine Alpha-Ketoglutarate, L-Arginine Pyroglutamate, L-Citrulline, L-Histidine, L-Ornithine Alpha-Ketoglutarate Purpose: Increase nitric oxide (NOX) levels, blood flow and dilation/volumization of cardiovascular and muscular tissues; improve quality of pumps (faster onset, harder)* Set 4: ("Strength-Endurance"): Beta-Alanine, Creatine Monohydrate, Di-creatine Malate, Medium-Chain Triacylglycerols (MCTs), L-Taurine, Ubiquinone (Co-Enzyme Q10) Purpose:Increase strength endurance (ability to lift a given weight for more reps without tiring)* Set 5 ("Anabolic Solidification"): Alpha-Lipoic Acid (ALA), Branched-Chain Amino Acids (BCAA: L-Leucine, L-Isoleucine, L-Valine) Purpose: Increase protein synthesis; enhance exercise-induced muscle hypertrophy; increase muscle size and hardness* Nutritional Information Serving Size: 1 Scoop Servings Per Container: 35 Amount %Daily Per Serving Value Calories 50.0 Calories from Fat 0.0 Total Carbohydrate 11.0 g 4% Sugars 0.0 g Potassium (as potassium citrate & monopotassium phosphate) 120.0 mg 30% Niacin (Vitamin B-3) (as niacinamide) 20.0 mg 147% Accelerated Nutrient Delivery System N.O. Releaser Proprietary Blend 10.0 mg -1% Sugar Alcohols (Polyols) 50.0 mg -2% D-Alpha Tocopherol (Vitamin E) 18100.0 mg Ingredients: Citric Acid, Natural and nature's equivalent flavors, Sucralose, artificial color (may including red no.40, yellow no.6, yellow no.5 (tartrazine), blue no.1 and blue no.2), silicon dioxide. 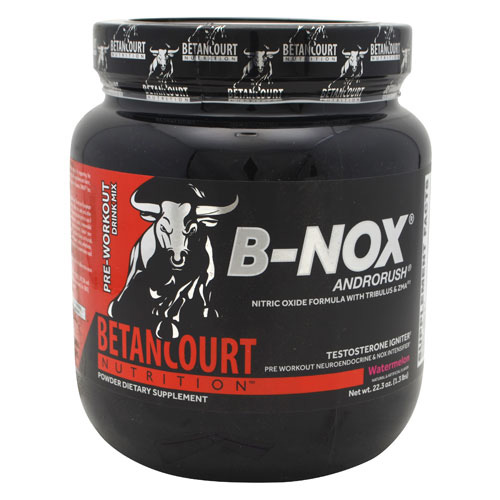 Recommended Use: Beginner Bodybuilding Athletes (up to 1 year of resistance exercise performed at least 3 times weekly): As a dietary supplement, mix 1 serving (18.2 g) thoroughly in 6 oz of cold water and consume 30 minutes pre-workout (before working out) on an empty stomach. Intermediate Bodybuilding Athlete (1-3 years of resistance exercise performed at least 3 times weekly): As a dietary supplement, mix 2 servings (36.4 g) thoroughly in 12 oz water and consume 30 minutes pre-workout on an empty stomach. Advanced Bodybuilding Athlete (>3 years of resistance exercise performed at least 3 times weekly): As a dietary supplement, mix 2 servings (36.4 g) thoroughly in 12 oz water and consume 30 minutes pre-workout on an empty stomach. 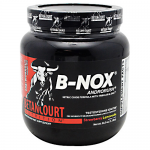 Important: if you have a sensitive stomach you may want to take Bullnox with a small amount of food prior to workout. 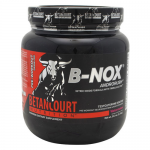 Feel new Bullnox working with you set by set! Pre-Launch: Set 1: Strength-Endurance, Set 2: Neural Energy, Set 3: Cardiovasomusclar Dilation, Set 4: Anabolic Solidification, Set 5: Endocrine Ignition Warnings: Not intended for use by persons under age 18. Do not exceed recommended dose. Do not use if pregnant or nursing. Do not consume synephrine or caffeine from other sources, including but not limited to, coffee, tea, soda and other dietary supplements or medications containing phenylephrine or caffeine. Do not use for more than 8 weeks. Consult with your physician prior to use if you are taking medication, including but not limited to MAO inhibitors, antidepressants, aspirin, nonsteroidal anti-inflammatory drugs or products containing ephedrine, pseudoephedrine, or other stimulants. Consult your physician prior to use if you have a medical condition, including but not limited to, heart, liver, kidney, or thyroid disease, psychiatric or epileptic disorders, difficulty urinating, diabetes, high blood pressure, cardiac arrhythmia, recurrent headaches, enlarged prostate or glaucoma. Discontinue 2 weeks prior surgery or if you experience rapid heart beat, dizziness, severe headache or shortness of breath. Keep Out Of Reach Of Children. Contains: Milk. Ingredients: Citric Acid, Natural and Artificial Flavors, Sucralose, Silicon Dioxide, FD&C Yellow 5 (tartrazine) Dye and FD&C Blue 2 Lake..